By providing any personal information to Boutique Pinkiblue and/or by accessing the site, you hereby agree to all of the terms and conditions of this Policy and consent to the collection, use and disclosure of your personal information as described in this Policy. You are responsible to ensure that your access to the Site and material available on or through it is legal in each jurisdiction in or through which you access or view the site or such material. The terms “we”, “us”, and “our” used in the Policy refer, collectively, to Boutique Pinkiblue and its affiliates, divisions, successors and assigns and their respective employees, mandataries and agents (collectively, “Boutique Pinkiblue Affiliates”). WHAT INFORMATION IS COLLECTED BY BOUTIQUE PINKIBLUE? 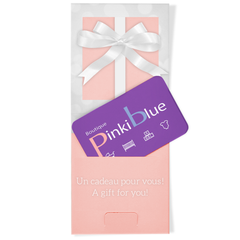 Any time you make a purchase, enter a contest, complete a ballot or otherwise provide personal information to Boutique Pinkiblue, it is collected, used and disclosed by Boutique Pinkiblue for various purposes as described herein. Moreover, every time you visit the Site, the following information is automatically obtained and compiled: your internet protocol (IP) address and the domain name registry information associated with that IP address; identification of your internet browser, operating system and hardware platform you are using; the date and time of your visit; the name and address (URL) of the web page you viewed immediately prior to accessing the Site; your entire query (if any) that was entered into a search engine which led you to the Site; and any other “click stream” data. This information is stored in our log files. Occasionally, if your browser is not configured to prevent disclosure of such information, the following information may also be revealed: your name, e-mail address, home and work addresses, telephone and fax numbers and any plain text commentary. Additionally, the complete record of your actions at the Site, including all pages visited, the time spent on each page, the information sent or received and the names of all files uploaded or downloaded is collected. This tracking information may be compiled by us in the aggregate and made available to third parties primarily to identifyf demographic data regarding our customers. As previously stipulated, we will also collect personal information from you when you provide your personal information to us, such as by completing an entry form to participate in a contest, ballot, promotion or survey, whether online or at one of our retail stores, by signing up for our newsletter (if any), by communicating with us by telephone, e-mail, in-store or otherwise, by setting up a user account and password, logging in as a registered user of the Site and providing information in your account(s). As a result of these actions, you might supply us with personal information, such as your name, date of birth, e-mail and postal addresses, telephone number(s), credit card information, product interest information and financial information and in certain circumstances, your opinions and individual preferences. We may also maintain a record of your product interests and acquire information about you from other present and future Boutique Pinkiblue Affiliates. • We may disclose your personal information to any Boutique Pinkiblue Affiliates, so that it may communicate with you (whether by e-mail, telephone, post or otherwise) and provide you with promotional materials and additional information about its products, services, promotions and special offers that may be of interest to you, or collect and use that information subject to and for other purposes contemplated by this Policy. • In the event of a sale of all or substantially all of our business or another similar transaction, we may transfer or disclose your personal information to a purchaser or prospective purchaser, who may collect, use and disclose such information for the purposes of evaluating and/or effecting a proposed transaction or operating and managing the affairs of the acquired business, or for other purposes identified in this Policy. • We may transfer personal information to non-affiliated third parties for processing on our behalf (such as fulfillment services, order processing, customer support, technical support, delivery services and financial institutions) pursuant to agreements that prohibit the third parties from using or disclosing the personal information other than for the purpose of processing and which impose security safeguards appropriate to the sensitivity of the information. These third parties are only provided with the personal information necessary to perform their specific service. You acknowledge that, in the event that a third party processor is located in the United States, your personal information may be processed and stored in the United States and that United States federal or state governments, courts or law enforcement or regulatory agencies may be able to obtain disclosure of your personal information under the federal or state laws of the United States. • We reserve the right to disclose your personal information as required by law, in response to legal or regulatory process and law enforcement requests by government authorities that have asserted a lawful right to access such information, to our legal counsel, or as necessary to protect the property, interests and rights of Boutique Pinkiblue and any Boutique Pinkiblue Affiliates. Cookies are small data files that a website stores on your computer’s hard drive or in random access memory when you are viewing the website. They keep a record of your preferences making your subsequent visits to the website more efficient. In certain cases, this information is only kept during the session and is deleted when you close your browser. In other cases, the information is stored on your hard drive and, upon your next visit to the website, the cookies are used to recall such information. Cookies may store a variety of information, including, a unique user ID that can be used to track the pages of the Site you have visited and the number of times that you view a particular page or other item on the website, login or registration information, your preferences and your purchase history, where available. No personal information is transmitted via cookies. Cookies, by themselves, cannot be used to reveal or discover the identity of the individual user; your acceptance of our cookies will not compromise your anonymity while using the Site. HOW DOI EXERCISE MY CHOICES ABOUT THE COLLECTION, USE AND DISCLOSURE OF MY PERSONAL INFORMATION? You have the choice simply not to submit any personal information to us, however this may limit our ability to serve you as it may prevent you from purchasing items from our Site or participating in our contests. You may also choose only to submit information constituting required fields when making purchases or completing contest entries. In addition, you may choose to limit how we use your personal information by not allowing us to share such information with third parties. In the event that you have already consented to the collection, use and/or disclosure of your personal information, you may subsequently “opt-out” at any time, subject to legal or contractual restrictions and reasonable notice, by contacting our privacy officer as described in the section entitled “Contacting us” below, or by following the “opt-out” instructions provided in the promotional materials sent to you. Our privacy officer will also be able to provide you with more information regarding the implications of withdrawing consent. In respect of requests not to receive promotional communications from us, please be sure to include your full name, address, telephone number and any e-mail address you used when you signed up or entered a contest on the Site, registered with or made a purchase from us. It may take up to two (2) weeks to process your request, during which period you may continue to receive communications from Boutique Pinkiblue. If you prefer not to receive promotional information from Boutique Pinkiblue, please follow the unsubscribe instructions set out in our communications with you. HOW CAN I ACCESS OR CHANGE MY PERSONAL INFORMATION OR MAKE INQUIRIES OR COMPLAINTS IN RELATION TO THIS POLICY AND BOUTIQUE PINKIBLUE’S PRIVACY PRACTICES? You are entitled to request access to, and, if necessary, correct your personal information collected by us. In order to make such a request, please contact our privacy officer in writing (see “Contacting us” below). PINKIBLUE WILL REMOVE ANY OF YOUR PERSONAL INFORMATION FROM OUR DATABASE WITHIN A REASONABLE PERIOD OF TIME PURSUANT TOA WRITTEN REQUEST FROM YOUIN THE EVENT SUCH REQUEST IS SENT BYE-MAIL, PLEASE IDENTIFY YOUR FULL NAME AND PLEASE TYPE “REMOVE REGISTRANT” IN THE SUBJECTLINE OF YOUR E-MAIL. You can also contact our privacy officer for any questions about or to make any complaint in relation to this Policy, as well as to Boutique Pinkiblue’ privacy practices in general (see the “Contacting us” section below). We take great care in trying to maintain the security of personal information we have collected. We have adopted physical and technological processes and procedures to protect the confidentiality of personal information and to safeguard personal information against loss or theft, as well as unauthorized access, disclosure, copying, use or modification, in light of, among other things, the sensitivity of the information and the purposes for which it is to be used. Furthermore, each and every Boutique Pinkiblue employee, mandatary or agent must abide by this Policy. Although we do not take responsibility for any theft, misuse, unauthorized disclosure, loss, alteration or destruction of data, we take reasonable precautions to prevent such occurrences. Boutique Pinkiblue also strives to offer its customers a secure shopping environment. OUR SITE MAY CONTAIN LINKS TO OTHER WEBSITES THAT ARE NOT OPERATED BY BOUTIQUE PINKIBLUE. THIS POLICY DOES NOT APPLY TO THE PRACTICES OF THIRD PARTIES AND BOUTIQUE PINKIBLUE DOES NOT ASSUME ANYRESPONSIBILITY FOR ANY SUCH THIRD PARTY PRACTICES OR FOR THE PRIVACY PRACTICES OF THE WEBSITES THAT IT DOES NOT OPERATE BY USING OUR SITE AND/OR ACCESSING A THIRD PARTY’SWEBSITE FROM OUR SITE, YOU RELEASE BOUTIQUE PINKIBLUE OF ANY RESPONSIBILITY FOR THE ACTIONS, PRACTICES AND OMISSIONS OF THIRD PARTIES. BY CLICKING ON ANY HYPERLINKS TO OTHER WEBSITES FROM OURSITE. YOU MAY AUTOMATICALLY SUBMIT TO THE PRIVACY PRACTICES OF THOSE WEBSITES. PLEASE CHECK THE PRIVACY POLICIES OF THESE THIRD PARTY WEBSITES. IN NO EVENT SHALL BOUTIQUE PINKIBLUE OR ANY BOUTIQUE PINKIBLUE AFFILIATES BE LIABLE TO YOU OR ANYONE ELSE FOR ANY DAMAGES OR INJURY WHATSOEVER (INCLUDING BUT NOT LIMITED TO DIRECT, INDIRECT, INCIDENTAL, SPECIAL, CONSEQUENTIAL, EXEMPLARY OR PUNITIVE DAMAGES) ARISING OUT OF OR IN CONNECTION WITH THE MISUSE OF PERSONAL INFORMATION BY THOSEWEBSITES.